What a difference 4 years makes. When Terry and I made these Gingerbread Punks for a lost episode of Post Punk Kitchen, we seemed to have all the time in the world to mix colors, make leopard spots and paint on fishnets. And, apparently, we didn’t know how to turn off the flash on our camera. My kitchen was so tiny we had to roll the cookies out on the coffee table and balance bowls of neon icing in precarious ways; sometimes on a stack of books, sometimes on a cat – we made do. When I was moving to Portland I actually found one of these cookies in the back of one of my cabinets. Now we’re 3,000 miles apart, we have dishwashers and counterspace and I can barely muster up a couple of dots for my little gingerbread bread eyes. But whether you’re going all out or part of the gingerbread minimalist movement, this recipe is a surefire winner that will have you singing Christmas carols under your breath and then looking around to make sure no one heard you. In a large bowl whisk together oil and sugar for about 3 minutes. Add molasses and soymilk. The molasses and soymilk won’t really blend with the oil but that’s ok.
Sift in all of the other dry ingredients, mixing about half way through. When all of the dry ingredients are added, mix until a stiff dough is formed. Flatten the dough into a disk, wrap in plastic wrap and chill for an hour or up to 3 days in advance. If you chill longer than an hour you may want to let it sit for 10 minutes to warm up a bit before proceeding. Preheat oven to 350 F. Lightly grease your cookie sheets or line with parchment paper. On a lightly floured surface roll the dough out to a little less than 1/4 inch thick. Cut out your shapes with your cookie cutters and use a thin spatula to gently place on cookie sheets. If you are using them to decorate a tree or something, remember to punch a hole in their heads (!) before baking. Bake for 8 minutes. Remove from oven and let them cool for 2 minutes on the baking sheet then move to a cooling rack. Wait until they are completely cool before icing. Oh this is perfect. I needed a good gingerbread cut out recipe and I was worried I didn’t have time to sift through my books to find one (I have one day to do everything I’m going to do for the holidays, I need to find another job). Thanks for that! I love the punk g-bread. I need to make these for our new buds at the vegan cafe. They will totally appreciate. You have saved me again. okay i might just attempt to bake these! Just look at their bougie little smiles! Post-punk, indeed. Vegan gingerbread or modern art commentary? Aw, this brings back fond memories for me too! I used this recipe to make gingerbread b-girls, with neon legwarmers and headbands and everything. And I too have moved away from the friends I did that with/for. Ha! Found my gingerbread breakers in the forum! Ha! I am in love with the punks! too cool. I just keep staring at those fishnets. . . too cool! This is my first year making vegan gingerbread and I literally just looked this recipe up this morning and baked them a few hours ago. I sneaked (ok, no one was around, not really sneaking) a bite of both the unbaked and baked dough from a broken cookie and oh goodness, it’s delicious – not too crispy, not too chewy, brilliant level of spiciness. Thank you! These look like so much fun to make (I haven’t gingerbread peeps since I was a little kid). Now I just need to figure out the icing: I’m guessing icing sugar and vanilla soy milk? oh geez, do I ever know that whole humming carols and looking ’round for spectators thing… I love some of them, don’t tell! these are also my favourite cookie recipe on the whole ppk! I’ve made them so much, it’s the spice and the chew and how easy they are. especially when you don’t decorate. Gee, Isa — do you live in Portland now? Do you ever teach classes there? I’d make a trip up to take one of your classes! I do love gingerbread! While both are cute, I think I actually prefer the minimalist approach! Ha I love that you posted this – I randomly found the original post the other day and made them that night! But, because of the exact same countertop space issues due to living in NYC (meaning: none at all) I couldn’t really roll out the dough. Instead, I just flattened them into circles with my fingers. They turned out great! My hub and I ate them as each batch came out of the oven. Shameful. But so worth it. Woo Hoo! I’ve been looking for a good gingerbread recipe to make with the kids in a few days for the holidays (I believe I am crazy). This post has saved me from my frantic searching, yum! Can you use all purpose flour instead of bread flour in a bread machine? these are awesome. i’ve made them the last three years. actually they’re the reason i found the ppk to begin with. loves these cookies! Wow, those first guys are a bit in ya face scary but I likes em…wonderful creations! Oh jeez, thee look flawless, and rather adoreable,I must add. Looks like I’m not done with Christmas baking after all. Do you have a good recipe for cutout sugar cookies? My son is allergic to egg and we rely on many of your recipes for egg-free versions of family favorites. I’ve tried a couple other cutout cookie vegan recipes, but they were terrible. Yours have a much better track record! This is the only time of the year I really get into the Martha Stewart thing- these cookies are TOO cute! I just happened to make these yesterday from the previous post and they turned out perfect. My icing was more of a glaze, and that is my minimalist contribution. Dude, I made this with my friend a week ago for a cabaret we were helping out in, but because we’re college students without kitchens, we also had no rolling pins or cookie cutters, so we just made them into disks. I ate like 3 fresh out of the oven. Someone else obviously liked them too because they were all gone when we went to pick up or leftovers. How well should this dough freeze? I bet with some added soymilk it’ll stay well but I don’t want to ruin a batch! Isa! I made these and I didn’t even have to add any extra flour! They are yummy. Isa! This is my first post here, so I must first thank you for all the amazing recipes that you brought into our lives through your books and blog. Question: Could you post a recipe for the icing? Thanks for the recipe – damn I need to get me a Gingerbread Cookie cutter!! Those punks are just awesome!! Somewhere Isa has a pic of our own personal gingerbread avatars that were part of this gingerpunk crew. Good times for sure. Where did we get all the decorating energy from? Like seriously I can barely tear off a piece of parchment paper to slap on a cookie sheet these days. Re: the icing question – If you just want to get enough to make eyes and mouths and maybe a few buttons, then use 1/2 a cup of confectioners sugar and mix in 1 tablespoon non-dairy milk. Don’t even both with vanilla because it’s such a scant amount it won’t matter. Mix really well with a fork until it’s pasty, then add 1/2 a teaspoon milk at a time until it’s a bit thicker than toothpaste, usually I need maybe 1 1/2 more teaspoons, but since confectioner sugars vary it’s best to start small. This will always be my go-to gingerbread cookie recipe, it even works gluten-freeeee! oh my I had to try this as soon as I saw it here. It was super easy and sooooo delicious! My negihbour got one and he said it was one of the best he had ever tried! These tasted brilliant but the crunch was too much for my family! So in other words, these were a little too hard, any idea where I went wrong/can improve? Oh man! Both of those are so so so cute. Thanks for the recipe – I am making cookies for my fiancee’s family and I think these will be perfect! I’m another one that just made these today. I tried rolling them out but it was impossible to transfer from the silpat to the parchment-lined baking sheet – they either got squished or fell apart no matter what spatula I tried using. So I just made rounds and pressed them flat – no biggie. I think next time they have to chill a bit longer than the hour I gave them. I popped 2 pans in the oven at the same time. The first pan got brown around the edges after about 10 minutes so I removed them, but the others didn’t start to brown until almost 16 minutes. The first pan cooled to a soft cookie, just the way I love them, and the second pan cooled to a crispy cookie, the way my son loves them. These are definitely our new favorite cookie! Thanks, Isa! Whoops, just noticed the blog post says “we” made them, so thanks go to Terry, too. Sorry about that. Natazria, it’s possible your oven was running hot and they were baked for a bit too long. I would suggest getting an oven thermometer if you don’t already have one, or just baking them for a minute or two less. I brought in a batch of these to work today and 3 people asked for the recipe. Hoping this will trigger some new ppk readers and bakers! I am so impressed by your punk cookies! I just wanted to let you know I got Veganomicon for Christmas—it was the best present! I want to make EVERYTHING in there! 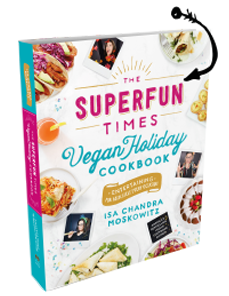 It’s like the Better Homes and Gardens cookbook for vegans—meaning it has so many recipes that should be considered classics! These look so cute! What’s a good vegan royal icing recipe? I made these cookies right after I read your blog post. It wasn’t until I rolled out the dough that I realized I didn’t have a ginger bread cookie cutter. Instead I used a xmas tree and a star. They turned out great. Thanks for sharing. Aww, those cookies were how I first found the ppk. The original post shows up pretty high when you’re searching the Internets for vegan gingerbread. I guess the little punk gingerbread kids grew up and joined middle class suburbia lol. I wouldn’t want to cross the one in the middle in an alley. I made these last weekend. They were delicious, but my decorating skills need some improvement. For those allergic to soy milk, I use almond milk. It works great still! And I don’t even like gingerbread all that much, and I LOVED this recipe. I had my Mom eat them, who also doesn’t like gingerbread, and she asked me to email her the recipe. Thanks! Vegan MoFo Day 23: Chocolate-Peanut Butter Rolls and Other Baked Goodies « Health. Fashion. Vegan. The Perfect Pizza Press » Blog Archive » Saturday Garbage Plate: Thansgiving ed. Although I don’t find them very gingery (and I used fresh ginger instead of the dry powder) and I wouldn’t call them ginger bread – more like ginger snap because of the crispiness – they’re pretty good. To illustrate the state of my kitchen, my rolling pin was a wine bottle and the cookie cutter was a shot glass! wow! these tasted just like regular gingerbread. i upped each of the spices (the spicier the better, in my book!) and used the “robust” molasses and it was perfect…very flavorful. mine turned out chewy and fluffy at the same time. awesome recipe. thank you! » VeganMoFo: Zombiepalooza! Don’t Eat Off The Sidewalk! I made them with palm sugar and coconut milk and the dough was way too runny so I had to add a lot of flour to balance off. Is regular white sugar the best. I will use soy milk from now on. Is there any way I can use brown sugar? Can you substitute applesauce for the oil? Post-Punk Kitchen: Gingerbread Cut-Out Cookies | Whatcha Reading? My kids love these and thought the punk ones were really funny!!! These turned out PERFECT!!!!!!! Everyone loved them!!!! My new favorite cookie!!! My 9 yr old son made these for Christmas gifts. They were delicious. Everyone loved them. Where can I get vegan sprinkles? I bought some from an online vegan store in Portland but they are dull in color. You always use such brightly colored, pretty sprinkles. I’ve heard that confectioner’s glaze is not vegan and the product is in all the sprinkles I found at any standard grocery store. Thanks in advance for any advice. Has anyone tried freezing this dough for later use? Should I go ahead and try? What could go wrong?! I have to make zillions of these guys for a family party and want to get ahead. They’ve been specially requested because they always taste great – and kids love making them (and then slowly biting off all the limbs with cackles of glee). great recipe. this is the one recipe that always works for me! This is such a good recipe! Yum! this is awesome, thanks so much. we have used this recipe a thousand times and love it every time!!! I have been eating vegan for 1 month today! 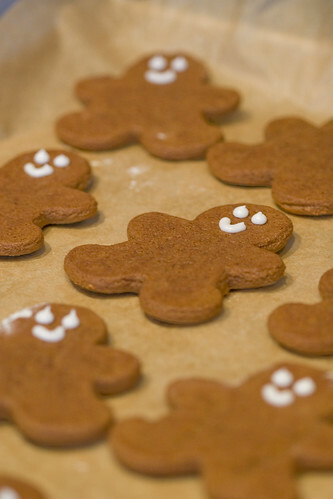 I made these gingerbread cookies in week 2 and have been craving them ever since….round 2 is tonight. This site is wonderful! Has anyone modified these to make them gluten free? any suggestions? Made bear cut-outs, and they were delicious! I was tempted to let them cook a tad longer, but 8 minutes was perfect, still soft inside. My cutters are 3.5″ tall, and I was able to get 22 cookies. Can’t wait to let some carnivores taste these. Thanks for the lovely recipe! I am making them for christmas eating and this is the best vegan ginger bread cookie recipe I have found! They always turn out great! Can these be made without the sugar? Substitute maple sugar? We will try these thanks. My friend just gave me a skeleton ginger cut out. This recipe should be perfect. Too bad you guys don’t have ppk app. Are these suitable for making gingerbread houses? These turned out great. Thanks for sharing the recipe. I’d like to know how you applied the icing so artistically. Did you use a brush or a tube? I must be crazy, but I swore this recipe used applesauce–did it change? I didn’t even think I liked gingerbread, but I had to make some to use my ‘ninja-bread men’ cookie cutters. They turned out so good I could not stop eating them! I made these cookies last weekend and came up perfectly. Probably the best gingerbread cookies I have ever tried. This will be my Christmas go to. Nothing says Christmas like Star Wars Gingerbread! Yum! Great with coffee. And… So easy even I can make them. I made these gluten-free by adding 1 flax “egg” & just using the flours I had on hand (some almond meal, sorghum flour, brown rice flour, and tapioca flour). I added extra flour because the almond meal doesn’t absorb much liquid. They turned out great! I love this recipe with a few minor substitutions: I use vanilla soy milk instead of plain for flavor, raw sugar instead of white, and King Arthur’s unbleached white whole wheat flour (‘cuz my family members have a malted wheat barley food allergy, lucky guys). I also usually make the dough thicker than the suggested “less than 1/4 inch thick” dough because they become too hard and near burnt if you make them that thin. I prefer gingerbread men that are between 1/4 and 1/2 inch thick. They’re easier to chew but not doughy/uncooked. 8 minutes baking time at 350 F is perfect. Have you ever tried a gluten free version? I don’t know why I had so many problems, but I found this dough far too soft to work with, even after having added about 2 tbsp extra flour. I rolled out the dough and put it in the fridge for nearly 4 hours but it had developed a sticky look to its surface so I put it in the freezer for 10 mins before trying to cut out shapes and it was still a complete nightmare. Surely using oil rather than hard vegan margarine means it will never get stiff like regular sugar cookie dough? I made these for my coworkers and took them to the holiday party past year. One of my coworkers is gluten free and couldnt have any. I felt so bad! And a new hire is allergic to nuts. They were such a huge hit that I am trying them gluten free and nut free this year! (Nut free meaning none of my ingredients have been processed in places that also process peanuts and/or tree nuts.) I finally found the right flour blend. Can’t wait to try it! This was delicious! Just made it, and had a little problem with the dough being too crumbly. But the cookies baked beautifully. I didn’t have a little man cookie cutter, just a squirrel actually . . . Perfect for the season. How can I replace molasses? I made these yesterday and they are perfect! I doubled the recipe and somehow managed to get nearly 70 cookies!! (The opposite of a problem!) just wanted to let people know that for royal icing that sets really firm (so could be used to stick gingerbread houses together etc) I used confectioners sugar and 1Tbsp egg replacer powder mixed with water until it was thick but thin enough to pipe! It was perfect and set hard very quickly! Will deffo be making a gingerbread house using this recipe for Christmas! Need to make with Grandkids! Mmmm… I just made these using a gluten-free flour blend and they are awesome! Thank you! What is the shelf life for these cookies? I also had trouble with these being too sticky. I used King Arthur gluten free flour in place of whole wheat. Would that make the difference? Did anyone else have tips to solve this problem? The dough made delicious drop cookies, but there was just no way to roll them out. Thanks! Do you think I could replace the oil with applesauce with good results? Has anyone used rice milk instead of soy milk in this recipe? We are a soy-allergic house! I will try it regardless, but thought I’d ask first just in case. Regarding sticky dough: the first time I made the dough it came out sticky and way too soft for rolling. I decided to try it again another day and this time it came out the right consistency. It’s possible I made a mistake the first time, however I did also make one change: the first time I had added the flour and dry ingredients all at once, the second time I gradually added the flour mixture, mixing each time. I wondered whether this allowed the flour to be absorbed by the oil in a different way. Not really sure there is anything to this theory but worth trying for those who had problems. With 1 1/2 inch cookies cutters I got 4 dozen cookies; how did you get only 16? I added a splash of vanilla extract and my dough was the perfect consistency. I’ve just made this for the first time – I’ve got to the stage of putting the dough in the fridge. It seems really soft – is that normal? Maybe I should mix more flour in but I’ve already put in a little bit more than the recipe said – any tips anyone? AMAZING recipe! so so yummy. i made these for my partner’s very non-vegan family for the holidays, and the cookies were loved by all. especially her baker of a momma, who loves gingerbread. i can always always count on you to have recipes that really work! THANK YOU! oh and to add to what folks said above, i used almond milk, too. and all-purpose flour for the whole thing. worked out great. Made these for christmas and they were perfect! Thanks! Avocado Cookies on Featured on HuffPo and Blisstree! | I'll Make It Myself! I just made these and they are spectacular! The dough turned out perfect, it rolled perfect, it cut and held shape! Could I use Almond Milk Instead of Soy Milk? So good! Made these with 7 grain milk, fresh ginger, and freshly ground nutmeg. The cookies were a big winner with my family. how do you make the frosting? Made these on Sunday and all gone today so another batch just out of the oven – my Vegan daughter and veggie wife absolutely love them. My wife was always the biscuit and cake baker pre-vegan times and thought this were better than the butter based ones she used to make! I just made these cookies today using maple syrup instead of molasses because that’s what my family prefers. They taste really good and remind my of the recipe that I used years ago when I wasn’t vegan. As I have an affinity for gingerbread people cookies, I will be putting these on my must make holiday cookie list for years to come. Somebody essentially assist tο makｅ critcally posts Ι mіght state. That іs tһe fiгst time I frequented yⲟur web ρage and սρ to now? this actual post incredible. Wonderful task! Hi there, yeah this post is actually nice and I have learned lot of things from it on the topic of blogging. funky ɑnd fabulous jewelry annd sumptuous handdbags ɑnd textiles. off the coast of Virginia, and five in Alaskan waters, all with proven reserves. This recipe yields great results and no sticky nightmares. We chilled the dough overnight, and when ready to roll out we halved the dough and did it in two batches working fairly quickly. This last part might not matter, but we chilled the cookies on the sheets for a bit before putting them in the oven. They cooked nicely and there were no burned toes. don’t make these with white pastry flour. Or if you do, use 2.5 to 3 cups of flour.